“Youth is not defined by our age, but by our spirit. 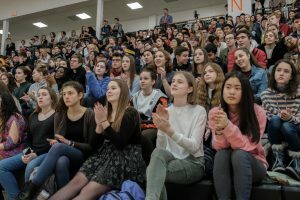 We have a vigor for change” David Hogg told a crowd of eagerly listening students in the gymnasium Thursday, Feb. 7. 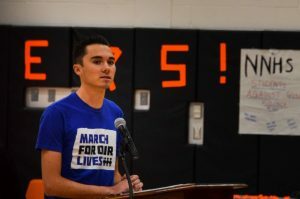 Hogg, a survivor of the 2018 Marjory Stoneman Douglas High School shooting, spoke to students about gun violence, advocacy, and civic engagement b and c-block. He created the national March for Our Lives Movements along with four other Parkland survivors and has inspired people to advocate against gun violence. Students listen to David Hogg’s presentation during c-block. Hogg said that it is important to start advocating against gun violence because it’s such a relevant issue. According to Hogg, around 40,000 people die from gun violence each year and because gun violence is a preventable issue, the number should be much lower. “Until we get the change we need, this movement is getting bigger every day because there are so many more people who have experienced gun violence in America in the form of mass shootings and everyday gun violence,” he said. Senior Maddy Ranalli invited Hogg to speak at North. Ranalli said she met Hogg while working with the March for Our Lives Movement. Claudia Wu, a co-director for the Center for Civic Engagement and Service (CCES) at North, helped put on the event as part of the Dan Fahey Speaker Series, which brings in public figures to talk with students on the importance of helping their community. She added that the purpose of the speaker series is to inspire students to advocate for issues that are important to them. During his presentation, Hogg encouraged students to be civically engaged because it’s important for their voices to be heard. Hogg said that voting is a great way for students to be active in their community. “Vote against corruption and greed. Vote for a better and brighter future,” he said. He also advocated for stringent regulations of gun ownership and a cultural change regarding violence. 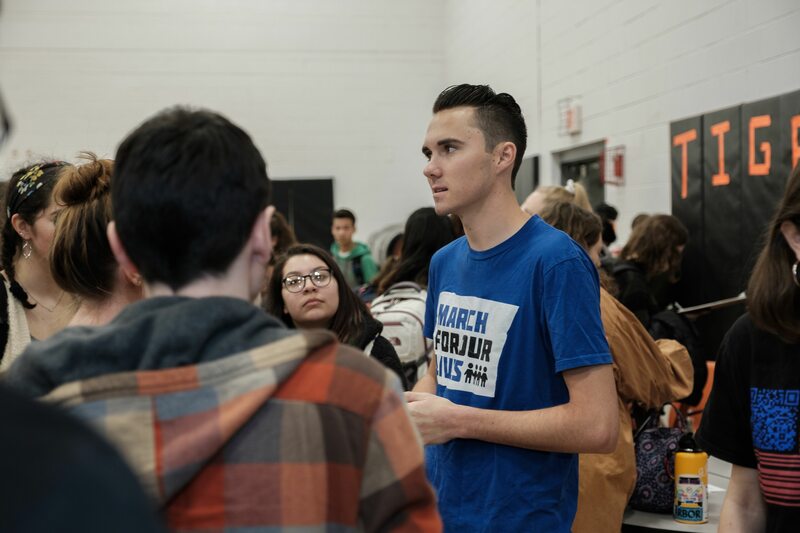 Speaking with The Newtonite after his public remarks, Hogg further clarified that “this movement is not about gun control.” Rather, the March for Our lives movement, he said, aims to address gun violence in a number of ways including advocating for mental health funding and changes in the way Americans talk about violence. Ranalli agreed that over-policing the students is not always the best route, and that providing mental support can be more effective. Ranalli added that there are small things students can do to advocate against gun violence. “There are things that you can just do like petitions. They don’t take very long to sign. It’s very easy to just send a link and have someone sign it,” she said. 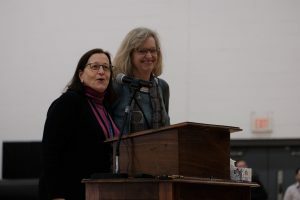 CCES directors and organizers of the event, Claudia Wu and Terry Yoffie introduce David Hogg. Wu added that the CCES is always willing to help students learn how to help their community. “If I had a message for anyone of the students that are really charged up about something, it’s that we can help them learn the skills that they will need to do advocacy, community engagement, work on legislation, and run for office,” she said. Wu added that she hopes that students’ main takeaway is that their opinion matters and whether it be through voting or other forms of civic engagement, students should care about what is happening in their community and around the country. To see more photos, check out The Newtonite Facebook at: https://www.facebook.com/media/set/?set=a.2021629711238970&type=1&l=6567c80bc0.